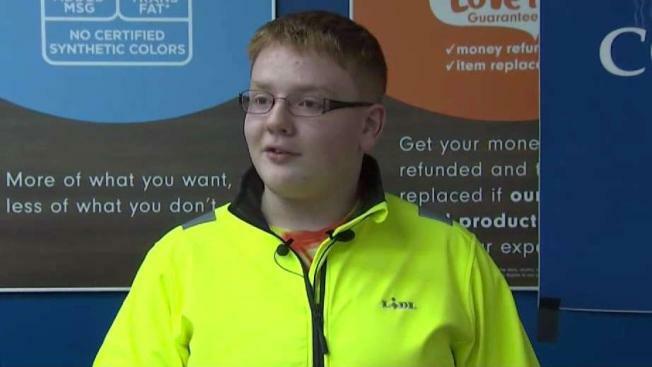 A Northern Virginia teen with autism who has a serious love for peanut butter handed out jars of his favorite food to people affected by the government shutdown. Eric McKay, known as "Bean," eats peanut butter sandwiches on toasted English muffins three times a day. "It’s just good. It’s good," he said. But Bean doesn't like just any peanut butter. He prefers one particular type: Lidl's store-brand creamy peanut butter. "It’s good — and not chunky," he explained. After finishing a whopping 72 Lidl peanut butter jars his mom had bought on sale, Bean took to Twitter last October to display the empty jars. Lidl responded by giving him another 72 jars and challenged him to get 72,000 retweets for a lifetime supply. Bean won the challenge and recently decided to donate a portion of his winnings to people affected by the federal government shutdown. "He’s an awesome kid. He’s always been an awesome kid, but now, you know, he's old enough that he's reaching out in the world and he's affecting more than just our family," his mother Tracy McKay told News4. His father, Jonathan Lamb, is one of hundreds of thousands of people without a paycheck during the shutdown. "It’s sad that it's come to this," Lamb said. "I’m very proud of how my son has handled it." On Wednesday, Bean and his family handed out free jars of Lidl peanut butter to furloughed workers at the Lidl store in Dumfries. "It's easy and it makes people happy," he said while doing a dance. "I'm dancing. I'm just happy right now. That's the emotion we're going to go with."